Every two years, the Paris Air Show hosts some of the fastest and most fearsome military aircraft in the world. During the Cold War, seeing a MiG-29 fighter jet perform outside the Soviet Union was a rare treat. Attendees at the 1989 Paris Air Show were excited about the chance to see one. 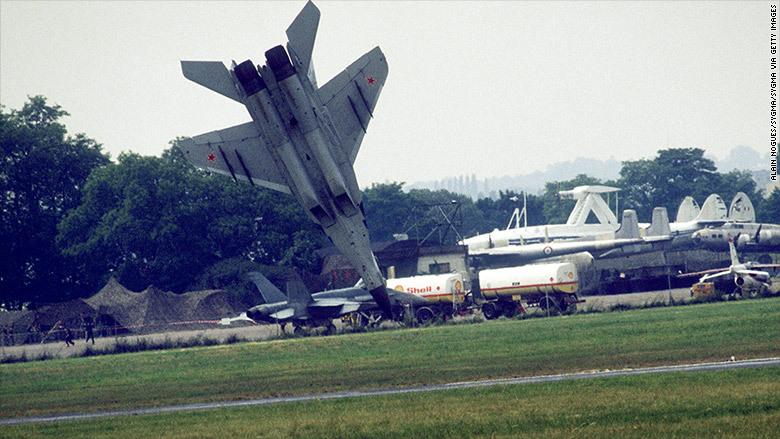 But during the MiG-29 performance, things did not go well. At the low altitude of about 500 feet, the jet's right engine lost power, sending the aircraft pointing toward the ground. The pilot ejected safely just two seconds before the plane crashed into a grassy area, away from onlookers. No one was hurt. Click through the images to see other military aircraft at the Paris Air Show over the years.